Soon it will be the season to plant bulbs for early spring color. You can have a colorful garden very early next spring if you plant some bulbs right now. Early-blooming Daffodils, Hyacinths, Tulips and many other colorful bulbs will get the jump on spring and reward you with colorful gardens before the dogwoods bloom in spring. Bulbs need warm soil to build roots before winter, but if you plant in early fall there’s little danger of bulbs sprouting too early. An important point to remember about bulbs is THE BIGGER THE BULB THE BIGGER THE BLOOM. Bulbs are graded and priced by bulb size; bigger specimens cost a few cents more but have larger bloom and more blooms per plant. Mature daffodil bulbs are 14-16cm diameter. Tulip bulbs should be at least 12cm, and Hyacinth at least 16cm. With bulbs, pedigree is important and so is freshness and quality. Your biggest investment is your own time and effort, so don’t waste it on inferior bulbs. Bulbs like fluffy, nutrient-rich soils best and will do much better if you dig a fair-sized hole for them. Think of bulbs as plant roots without plants. The wider the hole you dig, and the better the soil you plant them in, the healthier they’ll grow and the faster they will multiply. Drop the soil into a wheelbarrow or bucket, crumble it and mix in bulb fertilizer. 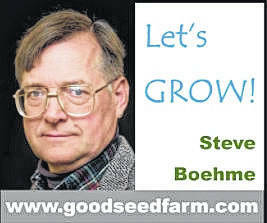 Bulbs like bone meal, a key ingredient in fertilizers like Espoma Bulb Tone. If your soil is hard clay, throw it away and use bagged topsoil instead, mixing bulb fertilizer with it first. Now add an inch or two of this mixture back into each hole. This puts the food where the bulb’s roots are. Set the bulbs into the holes with the tips pointing up. Now fill the holes with the rest of the soil mixture and press it down firmly. Flower bulbs can rot in wet soils, and they are attractive to rodents, so an ounce of prevention improves their chances. We recommend dipping tulip and hyacinth bulbs in a solution of Bulb Saver mixed with water. It helps prevent them from rotting and gives them a bitter taste, discouraging rodents. Like any plant they need water in order to grow, so the last step is to soak the area thoroughly. We’ve planted thousands of bulbs without ever using a bulb planter. It’s easy to tuck bulbs into freshly tilled soil just using our fingers, since we usually deep-till before planting so the soil is nice and fluffy. To “naturalize” bulbs in randomly-spaced drifts, we just scatter bulbs in open areas between other plants and then just tuck them in where they fall. Then we cover them with three inches of mulch. Small bulbs only need a few inches of topsoil/mulch over them. Larger bulbs like tulips and daffodils need four or five. This sounds radical but it’s easy. When you buy your bulbs just get enough mulch to cover them with, then add however many inches you need to get the proper depth. Instead of digging, you’re adding, which is much easier. Bulbs like mulch, to prevent weeds and keep the soil moist, so the top few inches can be mulch instead of soil. Over the years we’ve found daffodils to be the most rewarding, because they rapidly multiply into large clumps. We consider tulips to be annuals, since they are so attractive to rodents that they rarely survive more than one season. Either way, bulbs will give you an early spring show and then die back when the weather gets hot. Once the foliage starts to turn brown you can cut the plants off at the ground without harming them. Installing groundcovers like pachysandra saves you from even this simple task, since groundcovers will quickly cover the dead leaves of bulb plants.